Gornergrat, due to its unique location in an unspoiled high alpine environment at 3150m above sea level, the year-round accessibility via the Gornergrat Bahn, and the excellent infrastructure, provides unequalled conditions for successful research in astronomy and astrophysics. For a long time, the alpine area was not a place to go for the majority of people. It was considered as hostile to humans, and proper equipment, which would have been necessary to explore and to survive the alpine environment, was not yet available. Generally, the 1787 ascent of Mont Blanc by Horace Bénédict de Saussure is considered as the beginning of the touristic and scientific exploration of the Alps (see Figure). The volume of his meteorological, physical and geological observations made de Saussure a pioneer of alpine research with tremendous impact. But it was only in the middle of the 19th century that scientists finally conquered the alpine area. From 1838-1841, following the example of de Saussure, Louis Agassiz, who later became Professor at Harvard University in the USA, and who was the father of the then highly controversial glacial theory, led a scientific expedition to explore the glaciers of the river Aare and in the Jungfrau region. Working and living conditions were harsh. The extensive and successful scientific activity at Gornergrat is a direct consequence of the easy access offered by the Gornergrat Bahn. On August 20, 1898, after two years of construction, the railway to Gornergrat went into operation. It was the first electric cogwheel railway in Switzerland. Thanks to a spirit of innovation and pioneering, a unique tourist attraction was established. The mysterious world of the Alps was made accessible to all. As early as 1896, Joseph Perren and Joseph Biner built at Gornergrat the earlier Hotel Belvédère, which they handed over to the community of Zermatt ready to use for the price of 23’000 Swiss francs. Two years later, when the cog railway reached the Gornergrat for the first time, tourist traffic increased rapidly. The community of Zermatt quickly realized the significance of Gornergrat as a tourist destination, and built the Kulmhotel Gornergrat over a period of ten years, from 1897 to 1907. Construction costs at that time were about half a million Swiss francs. Due to high altitude of 3135m asl, the clean, dry air, and the favorable meteorological conditions, Gornergrat is an ideal site for astronomical observations. For a short time after 1950, when astronomical research in Switzerland was intensified, plans even existed to construct a national observatory. However, these plans were not pursued because in 1981 Switzerland joined the organization of the European Southern Observatory (ESO). Kulmhotel Gornergrat with the two astronomical cupola in 1970’s. The astronomical observatories at Gornergrat were installed in the late 1960’s in the two towers of the Kulmhotel Gornergrat. The rooms are leased from the Burgergemeinde Zermatt which itself is a member of the Foundation HFSJG. The Gornergrat North includes a 7.5 m cupola and a laboratory. The Observatory Gornergrat South was rented to the University of Cologne, Germany, from 1984-2010. It includes a 7.5 m cupola, a computer room, a workshop, a bedroom, a kitchen, and a bathroom. The instrument installed by the ‘I. Physikalisches Institut der Universität zu Köln’ was a high-tech 3 m radio telescope. Both observatories are open for guest researchers. In addition to the two observatories, the Physikalisches Institut of the University of Bern operated from 1998 until 2017 a laboratory container at the Belvedere terrace for measurements of solar neutrons. This apparatus has been installed in collaboration with the Solar-Terrestrial Environment Laboratory of the Nagoya University, Japan, and was the European cornerstone of a worldwide network of solar neutron detectors. 1966/67 Construction of a solar observatory on the north tower of the Kulm hotel by the Astronomical Institute of the University of Oxford (Prof. D.E. Blackwell). 1966/67 Construction of an astronomical observatory on the south tower of the Kulmhotel by the ‘Centre National Français de la Recherche Scientifique’ (CNRS) and the ‘Observatoire de Genève’ (Proff. J. Lequeux and M. Golay). The astronomical cupola and the 40cm telescope were those used until then at Jungfraujoch. 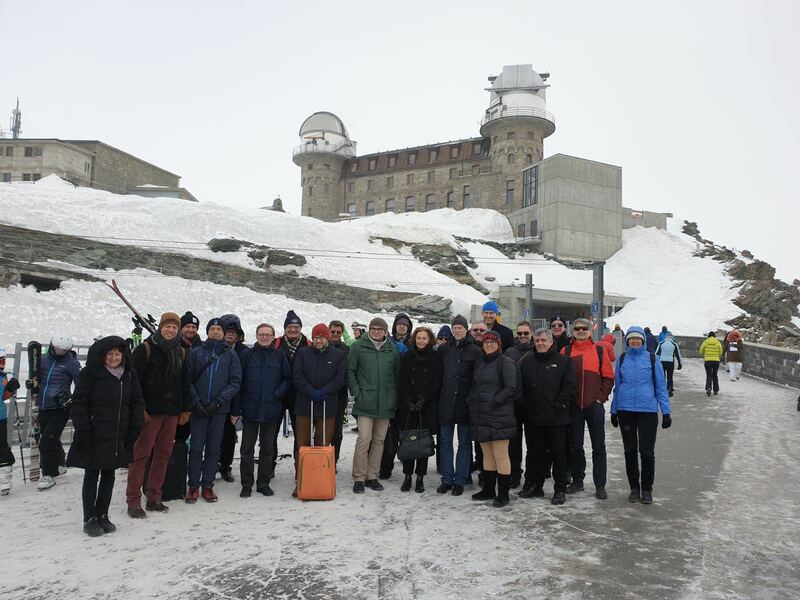 Administration of the two observatories at Gornergrat is assumed by the International Foundation ‘High Altitude Research Station Jungfraujoch’. 1973 Due to financial problems Prof. D.E. Blackwell has to stop his solar observations. In order to maintain Gornergrat as an observing site for astronomers, the International Foundation High Altitude Research Station Jungfraujoch takes over the two observatories Gornergrat North and Gornergrat South. Accordingly, the name of the Foundation is changed to ‘International Foundation High Altitude Research Stations Jungfraujoch and Gornergrat’ (HFSJG). 1974 Italy, represented by the ‘Consiglio Nazionale delle Richerche’, becomes a member of the Foundation. 1974/75 Construction of a new 7.5m cupola on the south tower by the French ‘Institut National d’Astronomie et de Géophysique, the ‘Observatoire de Lyon’, and the ‘Observatoire de Genève’, and installation of the 1m telescope ‘Marly’ by the ‘Observatoire de Lyon’. 1974/75 The observatory Gornergrat North is subleased to the Italian ‘Consiglio Nazionale delle Richerche’. 1975/76 Construction of a new 7.5m cupola at the north tower. 1979 Installation of a 1.5m telescope at Gornergrat North by the Italian ‘Consiglio Nazionale delle Richerche’. The INAF, Istituto di Radioastronomia, sezione di Firenze, uses the telescope for its TIRGO-project (Telescopio InfraRosso del GOrnergrat). 1979 The Gornergrat-Monte Rosa Railway joins the International Foundation High Altitude Research Stations Jungfraujoch and Gornergrat. 1985 The 1m telescope ‘Marly’ is dismantled and brought back to Lyon. 1986 The ‘1. Physikalisches Institut der Universität zu Köln’ constructs a new cupola on the south tower and installs a 3m radio telescope (KOSMA for German Kölner Observatorium für SubMillimeter Astronomie). 1991 The Burgergemeinde Zermatt formally joins the International Foundation High Altitude Research Stations Jungfraujoch and Gornergrat. 1996 Financed by the Deutsche Forschungsgemeinschaft (DFG), the old reflector of the 3m telescope at Gornergrat South is replaced by a new one, built to work at the short wavelengths (≤ 600 μm) of the submillimeter range. The surface accuracy of 20 μm RMS allows observations in the frequency range up to 900 GHz. 2001 SMART, the first dual frequency sub-millimeter SIS array receiver worldwide becomes operational at the KOSMA telescope. 2005 The buildings at Gornergrat that are the property of the Burgergemeinde Zermatt and the Gornergrat Bahn underwent a complete refurbishing to make the entire site more attractive for tourists as well as for science. TIRGO project ended. 2010 KOSMA (Kölner Observatorium für Submm-Astronomie) project ended.